I have a chronic tendency to show up to things late, so naturally, I didn’t find the best Easter-themed app until after Easter. But don’t go yet! If you have young kids or love apps like More Toast, you’ll still like this one year round, especially if you don’t feel like shelling out any of your hard earned clams for a new kids app. For full disclosure, this is a decidedly secular app, wholly on the side of the Easter Bunny. As you might have guessed, Dress Eggy is all about decorating Easter eggs. You get a basic egg shape, and you can choose the color you want to dye it, what embellishments to add on, and also what background to use. There’s a full array of color options and designs to select from, many of them which will result in particularly sophisticated looking eggs. I don’t know about you, but my Easter parties never featured damask-printed eggs or particolored Harlequin-looking eggs. Once the egg is “dressed” to your satisfaction, you can share it with friends. Unlike More Toast, Dress Eggy isn’t quite as good at giving users complete control. You have a wide range of options to choose from, but there is little in the way of freedom to apply features as you like. I would have liked to have seen some dynamic finger painting action or at least the ability to stick decorative elements where you please, but Dress Eggy is limited to selecting from the templates you wish to use. There’s still quite a bit to choose from, but it takes away from the handmade charm of dyeing eggs. On the other end of the spectrum, I would have also liked to have seen some options to make really spectacular eggs, like in the style of Ukrainian pysanky (http://en.wikipedia.org/wiki/Pysanka), but that might have been too much to hope for in an app so strongly kid-oriented. Although, in that case, an option to use the results in an Easter egg hunt would not have been amiss. Alas, Dress Eggy is about as basic as it gets, but still, for a nice , holiday-themed, kid-friendly app, you can’t really complain. The interface is clean and easy to use, the eggs are pretty, and if you don’t like it, you can just delete it without any qualms whatsoever. In my book, that’s almost as good as leftover Easter candy. 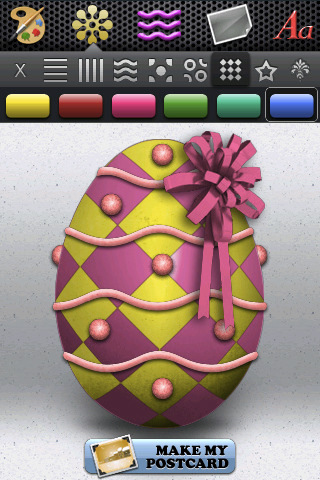 AppSafari review of Dress Eggy was written by Tracy Yonemoto on April 13th, 2010 and categorized under App Store, Art, Events, Free, Games. Page viewed 4579 times, 2 so far today. Need help on using these apps? Please read the Help Page.